It’s been crazy around here with family in town all this past week, so that means it’s time for another guest post! And once again that means highlighting something from Laura at orgjunkie.com. Like an earlier post of mine, Laura also has a nifty little idea for the inside of cupboard doors, but this was a tip for bathroom cupboards. 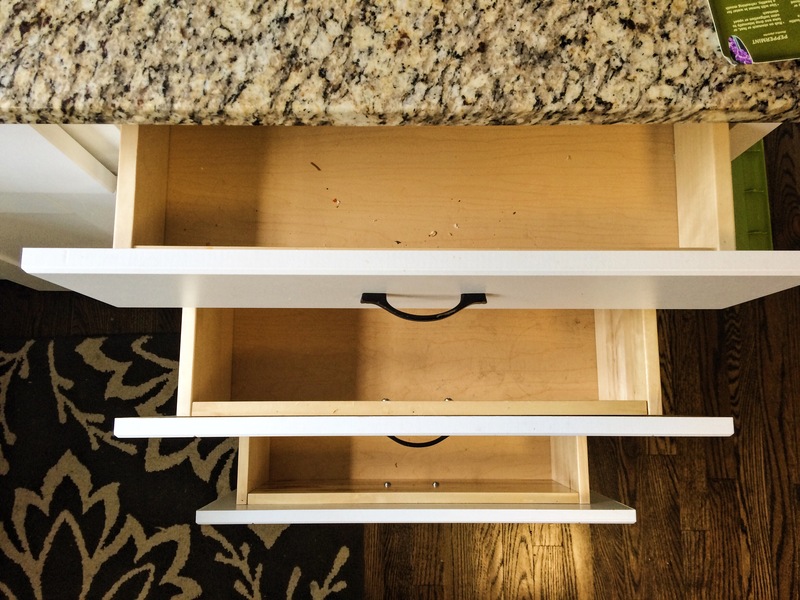 Her blog entry is about organizing a bathroom drawer, but near the end of the post she mentions a great idea for using the inside of the cupboard door. And since I wrote a post about a way to utilize that space in the kitchen (What’s Behind the Door? ), I figured I’d show how to expand on that concept by moving to the bathroom with Laura’s post. 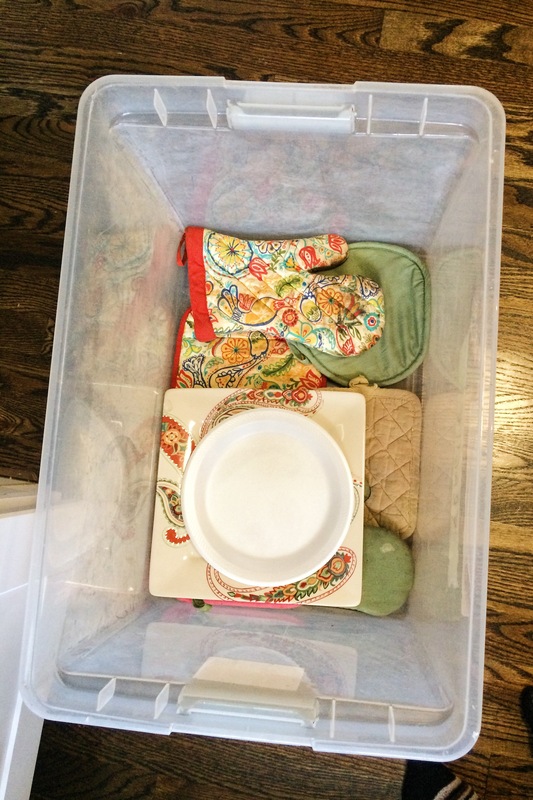 So, check out Bathroom Drawer Organization and see how you can make the most of wasted space. This past week I took one day and did a total closet purge. 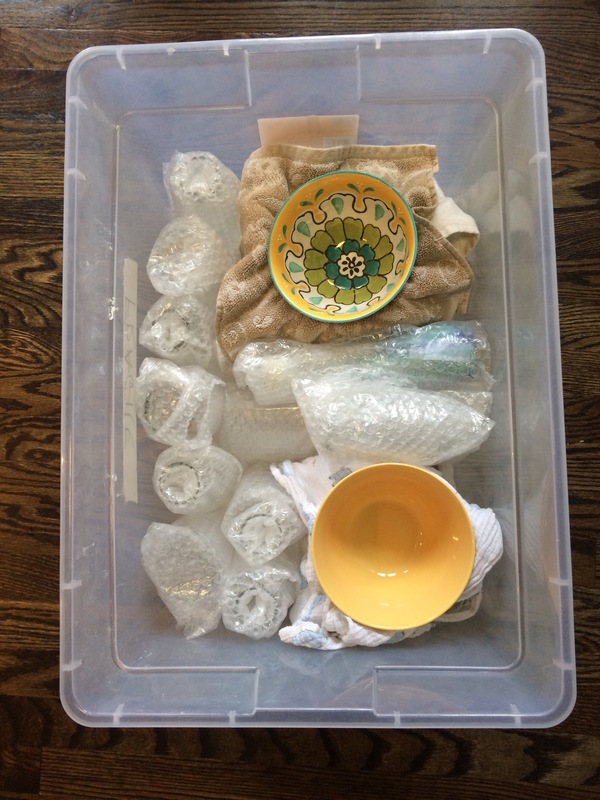 It was semi “Konmari” (if you aren’t sure what I’m talking about, refer to this link The Illustrated Guide to the Kondo Mari Method for a quick tutorial), but I didn’t ask the all-important “Does this spark joy?” question. I mainly thought, “Do I actually like this piece of clothing?”. Well, if you know me at all, you know once I get something in my head, I’m gonna do it full-out, especially when it comes to organizing. So what started as simply cleaning out my closet (and a storage bin from the basement with some non-wearable-in-the-winter-summer clothes) turned into dresses, nice t-shirts, every day t-shirts, jeans, skirts, sweaters, belts, scarves, shoes, workout clothes, pajamas, sweats and jackets/coats/vests. I’m a bit embarrassed to show the “Before” picture because it’s pretty bad. This is the smallest closet I’ve ever had and quite frankly I just don’t know what to do with it, especially since this isn’t my “forever” bedroom (for those of you who are ‘Eating an Elephant’ newbies I’m also a part-time live in nanny). I don’t want to invest in products that I (hopefully) won’t need once I move out. So, I’ve lived with this closet getting more and more stuffed as more and more clothes get bought and I just kept re-working where things went without addressing the real problem – I had too many clothes. I knew half of the stuff in there were clothes I had simply settled on or just didn’t wear any more, but there was a sense of security knowing I had more clothes if, for some reason, I needed them (and what that reason would be I have no idea). Anyways, I was finally tired of it and so I dedicated one afternoon (which it took) to going through EVERYTHING in my room and decided to toss it, donate it, or keep it. In the end, I walked out of my room with 1.75 garbage bags full of random clothing items, coats/vests, shoes, belts and scarves and one smaller bag full of clothes to throw away (become some things just aren’t worth donating) and a couple of items in the “mementos” box because, while I don’t want to get rid of them, I also don’t want them taking up valuable closet space. So, my tip for this week is: do this. Go through a clothing purge. I highly recommend it. Even if it’s not this coming week, even if it’s not every article of clothing you own, even if it’s just one category of clothing, set a day and time in your head when you have a couple of hours to go through your closet and then do it. Whether you’re holding on to something that you might one day wear (but probably won’t), or you have a sentimental attachment to a particular piece of clothing, getting it out of your closet and actually trying it on will help open your eyes to what needs to stay and what needs to go. And remember, I added a “mementos” category (for a couple special scarves and a couple t-shirts related to my old dance studio) so a few pieces can go in there as well. You just want to be able to really see each article of clothing you own, which isn’t possible when they’re in your closet on a hanger. The bag on the right was so heavy! Ignore the mismatched hangers. They’re working for me right now. Ideally I’d like the jeans turned to face front but this is the best way to store them with the small amount of space I have right now. Work out drawer – now able to hold t-shirts as well thanks to the Konmari folding method. Waaaay back when I first started “Eating an Elephant” I wrote a post about putting things together (like with like, I know, ‘broken record Jenna!’ but I can’t help it! It’s a great tip!). The post is “One of these things is not like the other” and it was about fitting things together categorically. This post is similar, but more about the point of origin. 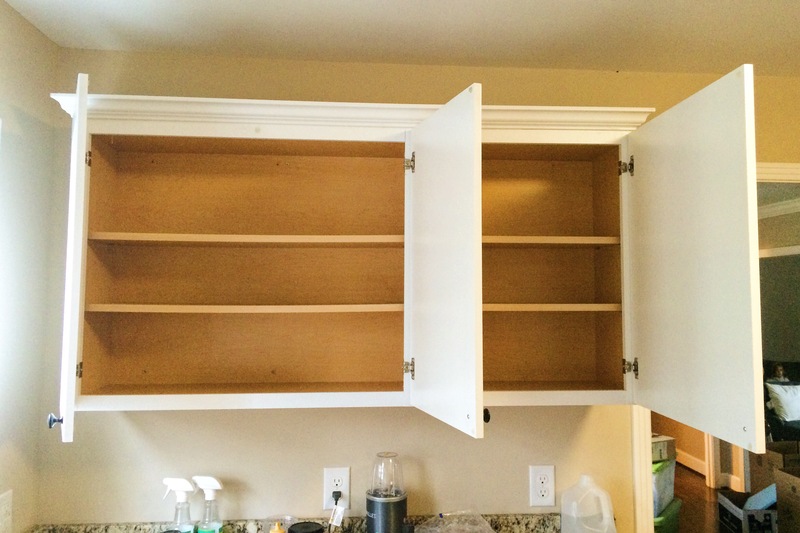 Think through your cupboards/spaces in your house where you store something. Does each space make sense? Or was it put there when you moved in and you just haven’t taken the time to find the correct space for it? Example: do you drink coffee? Are the mugs close to the coffee maker or are they across the kitchen in a random cupboard? What about the filters, grounds/beans and (if needed) coffee bean grinder? Does it make sense to walk around the kitchen to get all the required items, or just to keep them all in the same area? Personally, I think it makes sense to keep them in the same area. Maybe not in the same cupboard (although that would definitely be the most convenient), but at least in cupboard’s next to each other and right above (or below) the coffee maker. How about pot holders? Are they near the oven? Are your make up and hair supplies near the mirror you use? Belts near pants, dvds near the dvd player? Some of these may be “Duh of course they are” but I guarantee that’s not the case for everyone or even everything in your house. Look around your house as a visitor would and see if there’s anything that can be moved so your day can be just a bit easier. 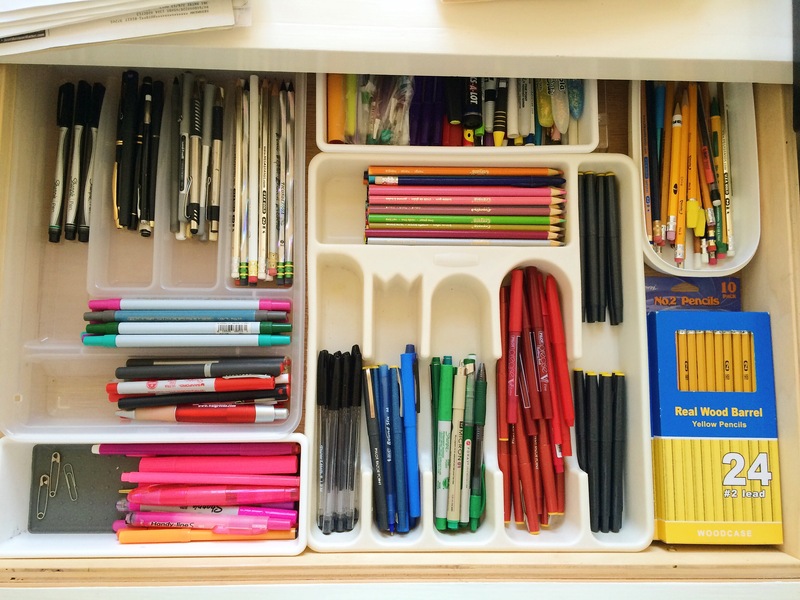 I was recently in a home where I was once again impressed with an organizing idea, and it’s another one I haven’t seen while perusing Pinterest or using Google Image Search (the first time this happened was when I saw this). Anyways, the homeowner had taken an old 6 pack container, wrote “Bug Spray” on it and put all of her bug spray bottles in it. She kept it simple and used a sharpie but you can get as creative and artsy as you want with this project. The best thing about it? Easy containment! And cheap too, since she used an item she already owned (which is what I love to do when organizing). When I expressed my excitement over her awesome organizing idea, she opened another cupboard and brought down another 6 pack container. This one said “Car cleaners” on it and she had put all of the smaller car cleaning bottles in it. Both 6 packs slid easily into her cupboards and she didn’t have to worry about hunting all over just to find the correct bug spray or car cleaner. 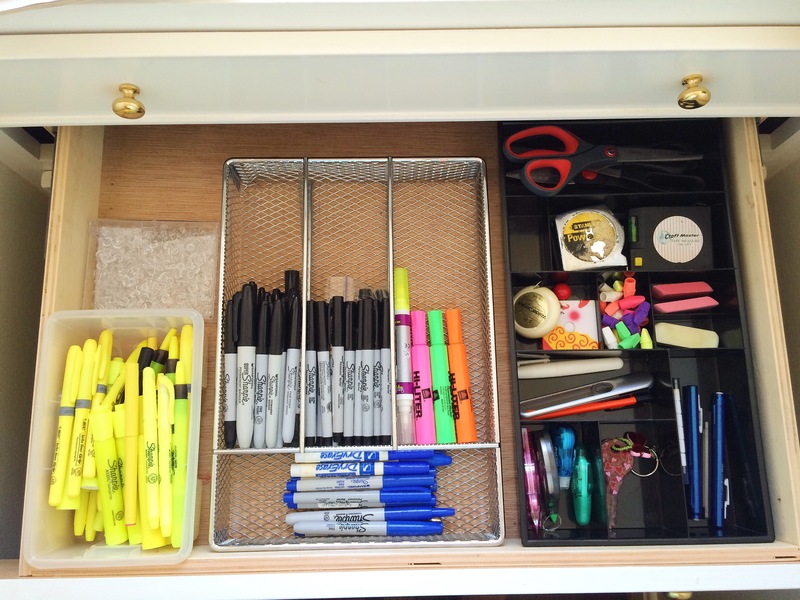 This a great, cheap, easy way to bring some organization in to your life. This working mom and her family lead a very busy life – both she and her husband have full-time, out of the house jobs and they have 3 young kids at home, as well as a large dog. So when Mother’s Day came around, this busy mom knew exactly what she wanted as a gift. 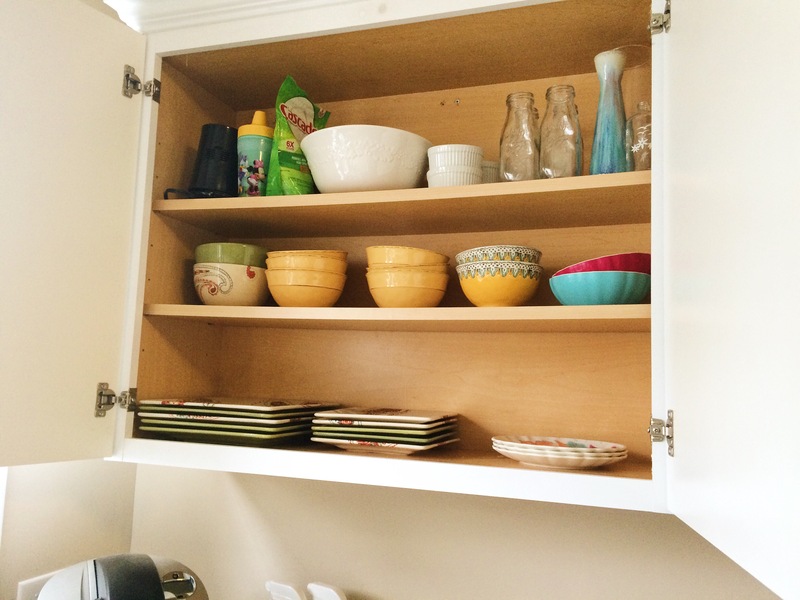 She contacted Top Shelf to organize her main area of frustration – the basement shelving unit. She wanted the items on the shelf to be accessible but still organized and stored, so no storage bins were needed for this job. I was able to work while the family was out of the house and within a few short hours had the shelving unit organized and usable for this active family of 5. I made sure to leave some space so as things get added or taken away, there will always be room for the items on the shelves. To see the “before/after” slide the blue line right and left. 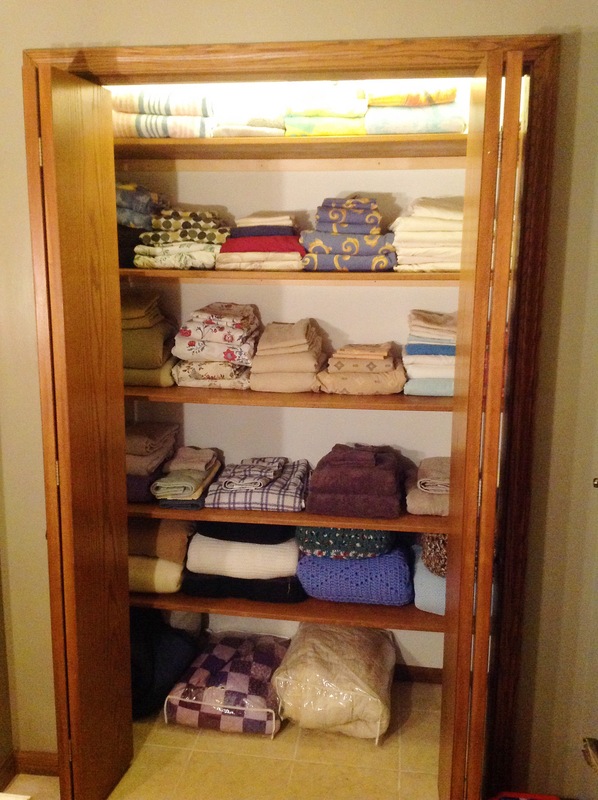 This job was especially dear to my heart – the linen closet in my old bathroom at my parent’s house. While I was visiting my parent’s one week my mom mentioned how nice it would be to have the linen closet in the downstairs bathroom organized – DONE! And in less than an hour! 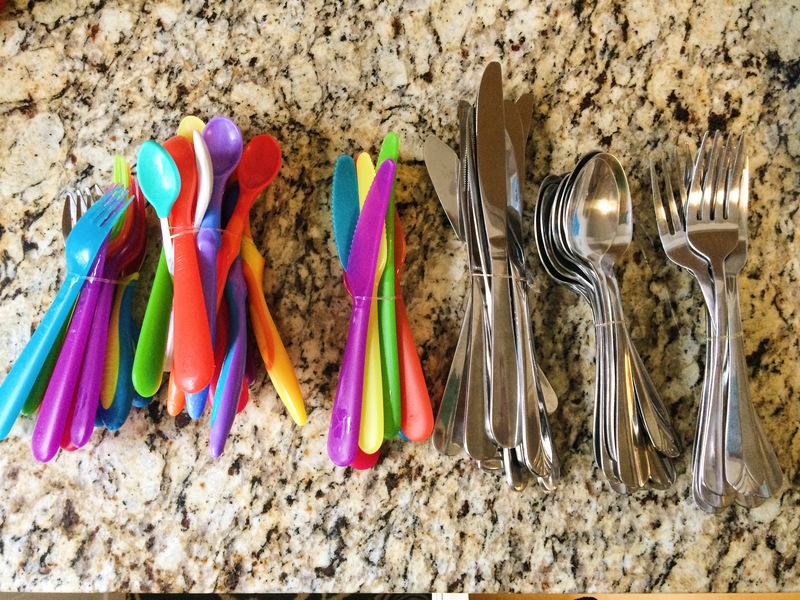 I have done this exact job many times as I grew up, but this time mother promised she would keep it organized…. We’ll see how long it lasts, but for this one moment in time, the bathroom linen closet was beautifully organized and peaceful. Slide the blue line left and right to see the “before/after” pictures. These clients are very dear to my heart. They are a sweet older couple who need semi-regular organizing work done throughout their house – mainly in his office regarding his paperwork. I work with them on a fairly regular basis and one day I showed up and the area they needed my help with that day was in the bedroom linen closet. The husband and his wife used to work in the antique business so they had many antique napkins, table runners, towels and other linen pieces throughout their regular sheets, towels, bedspreads and pillow cases. The linen closet was in desperate need of some organization, so I was more than happy to spend my morning hours helping my beloved Mr. & Mrs. out. The finished result was an organized linen closet with the frequently used items within reach, and the antique items accessible, but out of the way. This couple were getting ready for a move and desperately needed help in the kitchen before the moving truck showed up. With 4 girls 5 years old and under the didn’t have a lot of extra time and needed all the help they could get. She called Top Shelf and I was able to head over for the day and take care of the kitchen packing so she and her husband finish working on the rest of the house. Below are just a few snapshots I took throughout the crazy day. This client and her husband were preparing to put their house on the market and knew one space that would help lure in potential buyers was their amazing pantry. The wife knew that with 3 older kids (one in college but occasionally home) she would need something eye-catching yet also functional. So she called Top Shelf to help her unorganized and underutilized pantry get ‘open house ready’. As the family was in and out of the house, I was able to throw out what was expired, organize the items left by creating zones (the youngest daughter loves baking and was thrilled to have a ‘baking zone’ just for her) and finish the pantry looking organized and ‘open house ready’. And it was still functional enough for the family to maintain the organization throughout their day-to-day. This job took a full day (7 hours) to do, but the end result was definitely worth it. This client and his wife have amazing storage in their home. One room in particular is the office. He has a great built-in desk with lots of drawers and shelves and another built-in piece that resembles a dresser but with slim drawers. These 2 pieces have long been in desperate need of organizing and, fortunately, my client asked me to take care of them for him, which I gladly did in just 2 hours. Below are just a few pictures of the drawers I organized that day. Slide the blue lines right and left to see “before/after” pictures.